UM students and the University are working to reduce the carbon footprint around campus through a variety of initiatives and programs. Energy efficiency is a hot topic around the country as schools, businesses, and some homes are searching for ways to help reduce the earth’s carbon footprint. Now, students and staff at the University of Miami are doing their part to help reduce CO2 emissions through various campus awareness programs. Former UM President Donna E. Shalala in 2007 signed the American College and University Presidents Climate Commitment, which provided a strong and unequivocal message about the University’s dedication to sustainability. From this commitment the University created Green U, an office dedicated to reducing its impact on the environment. The University and Green U have narrowed the focus to three main areas: energy savings, waste diversion, and education outreach. The University currently has numerous energy projects in the works. Lucid Energy Dashboard, which was originally funded by the Student Government’s ECO Agency, connects all buildings to an online platform that displays in real time each building’s energy usage and CO2 offset. The tool helps facilities managers monitor electricity consumption and reduce carbon emissions. The Patricia Louise Frost Music Studios is in the process of getting certified LEED Platinum, the highest level of certification for sustainable buildings. The ECO Agency is committed to building an environmentally friendly campus. Its most recent project is the installation of a 20 kilowatt solar energy system on top of the Hurricane Food Court. The photovoltaic array was officially launched during Earth Week 2016 and is supplying 10 to 15 percent of the food court’s energy. Nika Hosseini, executive chair of the student organization,ECO Agency. 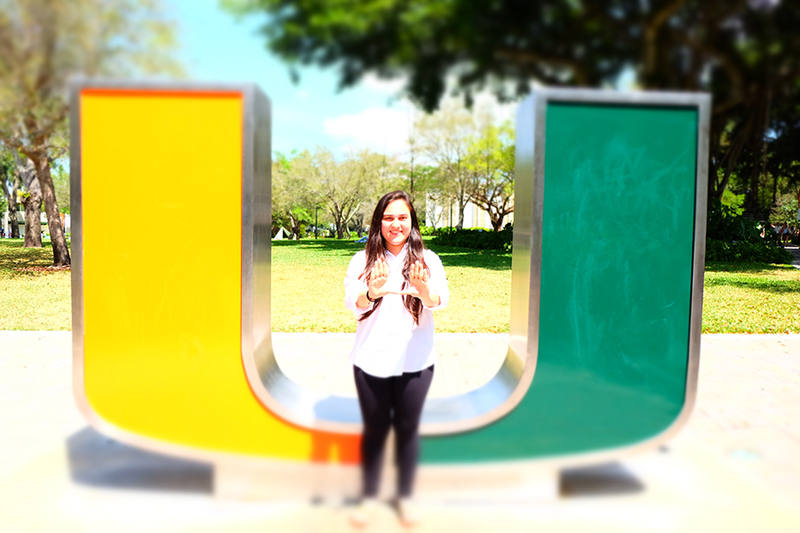 “As an environmentalist, every completed initiative, every student we reach on campus and every time we have a meeting, I'm overcome with positivity and excitement knowing the potential we have to be a force on this campus and the community beyond,” says Nika Hosseini, executive chair of ECO Agency and a recipient of the 2016 Coral Gables Chamber of Commerce Green Means Green Award. The solar pavilion is just one of the energy projects ongoing at the University. Since fall 2015 existing buildings have been switching to more environmentally friendly LED lighting. The University is also involved in promoting alternative transportation options, including car share programs, discounts on mass transit passes for students and employees, carpooling, shuttles, and dedicated bike lanes. The UBike Committee, which consists of students, faculty members, and administrators from various units and divisions, is dedicated to making UM a more bike-friendly campus. So far they have helped install bike maintenance stations on campus, built wider sidewalks, worked with the UM Police Department to provide free bike locks, and partnered with local communities to improve biking safety. 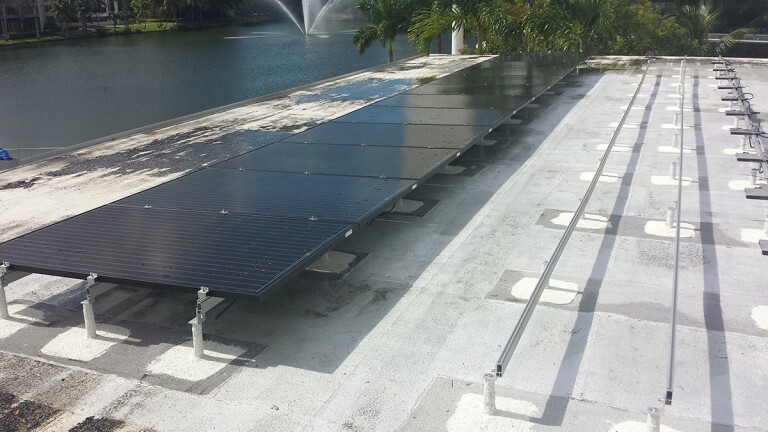 Solar panels installed on the roof of the Hurricane Food Court provide an alternative energy source that helps run the food court. The University also has implemented numerous programs to increase the rate of waste diversion on campus. Single stream recycling has become the standard for departments, buildings, libraries, residence halls, and outdoor common areas. Clean and empty recyclables like cardboard, plastic, glass containers, cans, and all types of paper or lightweight cardboard need to be placed in one single recycling bin. Some of that recycled material ends up in the 30- to 50-percent recycled paper purchased by the University, or in clothing at the UM bookstore. During the 2015-2016 academic year, the University accepted the Sustainable Endowments Institute’s Billion Dollar Green Challenge and created a green revolving fund (GRF), entitled the U Green Revolving Reserve, with an initial allocation of $1 million. The challenge encourages nonprofit institutions to invest a collective total of $1 billion in self-managed GRFs to finance energy efficiency improvements and cost saving sustainability projects that reduce environmental impact. The U Green Revolving Reserve (UGRR), an innovative financing tool that helps reduce energy costs and reinvest those savings back into other green initiatives, has been spearheaded by Brian Gitlin after he learned about the green revolving fund (GRF) concept at a conference. The UGRR’s inaugural project, proposed by Jose Varona, associate director for energy management systems, involves replacing the metal halide lights in the Patti and Allan Herbert Wellness Center’s main basketball gym with more energy-efficient LED lights. The project’s cost is $30,000 and, with annual estimated savings of $9,000 in utility costs, the investment will pay for itself in less than 4 years. The reserve is now seeking proposals for other green projects on the Coral Gables and Rosenstiel School campuses that will not only pay back their respective initial investments, but eventually generate enough savings to replenish the fund and pay for other green projects. Managed by a committee representing a cross-section of the University, the UGRR also plans to fund green-oriented research that could serve as test beds for national deployment. Other campus programs include toner and cartridges recycling, confidential paper recycling, kitchen food scrap composting, coffee ground composting, used cooking oil recycling, electronic waste recycling, and a yard-waste mulching area. Since 2008, one of the President Climate Commitment’s requirements has been the mandated LEED certification of all new construction at UM. The Leadership in Energy and Environmental Design (LEED) certification program is the most recognized standard for sustainable construction in the U.S. Currently, 12 University buildings are either waiting for certification or already LEED certified. One of the University’s newest buildings, the Patricia Louise Frost Music Studios of the Frost School of Music, stores and filters rain water through the building to be recycled for toilet flushing. A 50-kilowatt solar energy system, among other conservation efforts, have the building being considered for LEED Platinum certification. The North building has already been certified. Once the South side follows, it will be the first building in Coral Gables to achieve LEED’s highest level of certification. The Frost Music Studios also feature electrochromic glass. This special type of glass changes its shade based on how much heat is entering through the window, reducing energy costs. With the help of organizations such as ECO Agency and Green U, the University is taking steps to become more environmentally sustainable and is looking to spread the word about its efforts. Events such as Food Day, the Green Fair, RecycleMania and Earth Week give students, faculty, and staff a sense of belonging.